Fascinatingly, the Filipinos are fervent sports lovers. We tend to love everything extreme including riding ATVs. ATV stands for the all-terrain vehicle which is much like a motorcycle only that ATVs are three to four-wheelers. ATV Philippines is slowly becoming a pastime or hobby of the locals. Nonetheless, riding an ATV is one of the ways to explore a place of interest because it is tourism-driven. ATV riding is not only a fun hobby. It is also a way to explore the great outdoors. You can spend time under the sun and feel the cool breeze as you pass by different terrains. Another reason to try ATV driving is for the excitement it brings. It’s a way to get your heart pumping and relieve stress from a monotonous lifestyle. It’s also a way to meet new friends and connect with people with the same interest. If you get away from the city and unleash the adrenaline-junkie in you, then ATV riding in the Philippines is the activity you should seek. ATV riding in the Philippines is a recreational activity. Though it doesn’t pose any threat to your health, it’s essential to wear boots, gloves, and a helmet. If driving under the sun or in a desert, you should have googles or any protective eyewear. Don’t dangle your feet to the side to avoid getting them caught by the tires at the back. Use the nerf bars or heel guards if you wish to rest your feet. Think of driving an ATV as you would with a manual transmission. Before getting on the trail, you should practice how to use the clutch and shifting. Knowing how to change gears is the thin line between an enjoying ride and a boring one. You must also think about how to use the breaks. Though ATV riding is known for speed, part of driving and getting ahead is slowing down. When you know how to control the vehicle, you are sure to get a smooth ride. Here’s an ATV safety video by Dirt Trax Television to help you stay safe during the ride. The wide fields of Porac are the place where you can enjoy ATV Pampanga rides. Your journey begins from Sandbox which only takes 1.5-hour drive from Manila. The adrenaline-pumping ATV ride happens near Miyamit Falls at full speed on rough roads. ATV rides are also organized in-house in Paradise Ranch. Sandbox at Alviera also features a lot of other activities such as The Giant Swing, Aerial Walk Challenge, rappelling, roller coaster zip line, wall climbing, and many more. Aside from Boracay’s tricycles, the better way to explore the island is through an ATV or buggy car ride. Riders can stop at the scenic spots and take pictures before continuing the trip. ATV Aklan rides can take you to Ocean Tower if you want to marvel at the picturesque view of the whole island. Then, head to Everland Aviary Farm where you can meet various birds species. ATV ride is the newest way of seeing Batanes, launched only last June by Batanes ATV Adventure. The ATV Batanes excursions are guided tours along the rugged coastlines and endless pastures. There is no perfect vehicle to snake along the zigzag cliffside highway than an ATV and passing through main spots such as Basco Lighthouse, Chawa Viewpoint, House of Dakay and Mahatao Boat Shelter. An ATV can now tour Bohol’s Chocolate Hills. The difference in Bohol is its rocky yet muddy trails. ATV Bohol is available in Carmen within the Chocolate Hills Complex. Bukidnon’s Forest Park in Dahilayan now offers ATV and Buggy Trail Adventure. In Tarlac, adrenaline junkies prefer to go to Mount Pinatubo by riding an ATV. One of the famous trails among the locals is the Tambo Lake Trail wherein you can visit Tambo Lake going to the mountain. ATV rides in Davao at the entrance of Hagimis Falls is now available. It is the newest attraction in the area. There is a sloping road track that makes for a nice ATV Davao riding experience. In Barangay Pansol, Calamba, Laguna, you can find Adventure Park. The place is specifically designed for the extreme sports loving Filipinos and foreigners. There 1500cc AVTs that can be used in exploring the park. However, the park also has an ATV Laguna Adventure Track where riders can take it nice and slow or bravely fast. Riders are encouraged to bring clothes. ATV tours are also organized in Legazpi City by Your Brother. ATV Legazpi rides include a challenge outside Mayon Volcano’s 8-kilometer danger zone. Other trails are Mayon to Lava Front and Pawa to Cagsawa. Riders will drive through the natural gullies with small lakes and lush vegetation around. Zac Efron rode an ATV going to Mayon Lava Dome when he visited our country. Organized by ATV Ride Naga, adventure seekers can also explore the city specifically the immediate surrounding at the foot of Mt. Isarog Natural Park. Half-day tours include going to Malabsay Falls and Panicuason hot springs and enjoy the coldness of the water at the falls and the warmness of the water at the springs. You may also try wall climbing, wall rappelling and forest zip lining around the hot spring before heading to Haciendas de Naga Adventure Park. 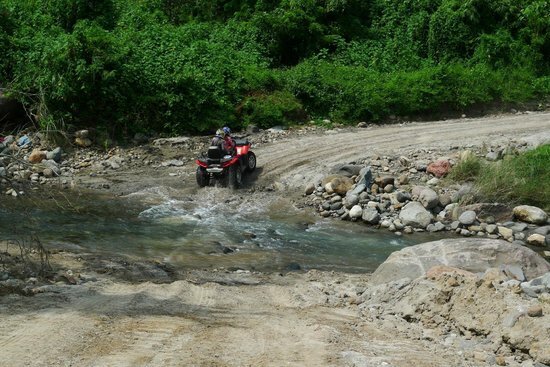 The Negros Oriental Provincial Tourism Office now provides an ATV ride along the rugged terrains of Valencia. Life is indeed a daring adventure, and we Filipinos know how to have one. ATV Philippines is slowly gaining grounds as evident by the sporadic introduction of ATV ride either as a part of a tour package or a tour on its own. This is not surprising though knowing how passionate we are when it comes to all sorts of sports!